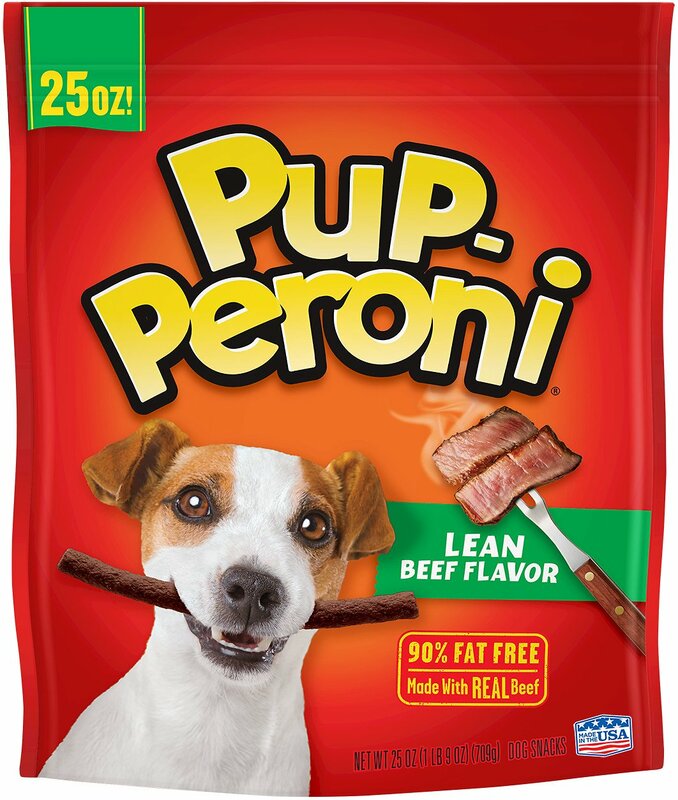 For all the beefy flavor and aroma that’ll make your doggy drool but without the fat, only Pup-Peroni Original Lean Beef Flavor Dog Treats will do. You can’t fool your dog when it comes to meat, and she surely won’t mistake the smoky natural scent of beef in these tasty treats. They’re slow-cooked to capture the appetizing flavor of real beef simmered in its own savory juices. What she won’t know is that these treats are 90% fat free, so they’re the perfect guilt-free reward for your loyal pal whether you’re on the road, out for a hike or just finishing up a fun fetch session. They also make an ideal training treat when broken into smaller pieces. 90% fat free treats make the perfect guilt-free reward whether you’re on the road, out for a hike or just enjoying playtime. Your dog won’t be able to resist the smoky natural scent of beef in these tasty treats. Slow-cooking captures the appetizing flavor of real beef simmered in its own savory juices. They also make an ideal training treat when broken into smaller pieces. Reward your loyal pal with these delectable treats made in the USA. Meat By-Products, Soy Grits, Sugar, Liver, Beef, Propylene Glycol, Salt, Garlic Powder, Caramel Color, Potassium Sorbate (Used As A Preservative), Natural Smoke Flavor, Sodium Nitrite (For Color Retention), Red 40, BHA (Used As A Preservative), Onion Extract. Feed as a snack or treat as part of a healthy diet. Break into small pieces for small dogs. Always monitor your pet while treating. 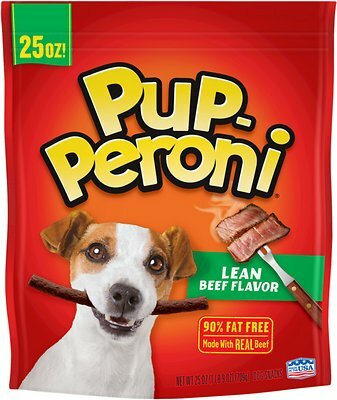 I love using Puperoni for training treats! It’s so easy to grab a stick or two and break it up into tiny bite size pieces to use for training. My dogs find them to be high value treats and always get excited when I open the bag. This is a pretty good price too. Just be warned that they dry out and get quite chewy if you leave them in your coat pocket overnight. The treats were excellent, great price, and puppy loves them. Chewy does a great job of shipping items quickly, good prices, and right to my door. Can't beat it! Invoices and items have always been spot on. Will happily endorse them. These are a big favorite with our Jack Russell. I only give her 1/2 a stick after the walk and she trot off in the other room like she has a huge bone to chew on. She will take these when she won't look at some of the other treats we have for her. Getting that email that says, my dog food is on the way is so good to get. I'm 77 and just don't feel like going to the markets dog food section and not finding what Jurnee likes. . . her PupPeroni sticks!!! I can get everything I need. It's like going to the big pet store from my small office. What a value you get for your money compared to the stores!!! Our “Lily” loves her lean pupperoni sticks ( A pug has to watch her figure). No where can the price be beat ! Thanks Chewy.com ! These were big enough to give my lab, and could be broken up to give my jack Russell. They both love the taste and will sit at the cookie jar I keep them in! Definitely a winner! Our girl, Ivy, loves them so much so that we have to keep the bag hidden from her . The bigger size bag is not on the shelf at our grocery store so I appreciate finding it in Chewy. 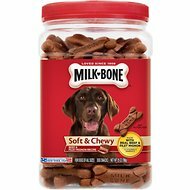 I buy these for my elderly dog as she tends to gain weight easily but I don't want her to not have a treat. She tells me these are delicious and she cannot tell the difference between the regular ones and the lean ones! Win, win!! I have used this for some time. Chewy has been so great with delivery. I would recommend them to any one. So far they have had anything I've needed. Yummmy! My pup loves these. Even my stubborn, independent minded aussie will be a good boy for a minute or two for a pupperoni-one of the words he responds to immediately.